GALA had an interest in two Georgia General Assembly Senate bills, neither of which passed the House, which is required for a bill to become a law. SB 373 The Georgia Enhanced Penalties for Hate Crime Act proposed extending crime penalties based on the victim’s sexual orientation and gender identity or expression. Georgia is an outlier among the states for not having such a provision. The bill was first introduced with a different purpose but was replaced with the Hate Crimes substitute in a House Judiciary Committee after it passed the Senate and came over to the House. The bill received no further action in the House. The second bill created permissions and protections for child-placing agencies which discriminate against LGBT+ people wanting to adopt children or be foster parents. Discrimination would be justified by “sincerely held religious beliefs”. GALA wrote a letter asking Governor Deal to veto the bill based on the 1st and 14th amendments, the weakness of the religious beliefs argument, potential financial harm to Georgia and Georgia’s citizens, and basic justice and fairness withheld from a single minority group. It is not constitutional to wall off a disfavored, disenfranchised minority and deny them equal protection of the law without a compelling scientifically provable reason. There is not a preponderance of evidence that LGBT+ parents are significantly inferior parents. Additionally, a statue should not deny aggrieved parties the right to redress their grievance with due process as specified in the 5th and 14th amendments. The purpose of law is to dispense justice. Inclusion, love and family are central to identity and happiness, and should not be denied to any person or group without justification that passes a high bar. The General Assembly operates on a biennium calendar, meaning Representatives and Senators are elected every two years. Bills not passed the first year are carried over to the second year, but all bills not passed at the end of the second year can no longer be acted upon unless reintroduced in the next elected General Assembly. As “religious freedom” is a high priority for conservatives and discriminating against LGBT+ people seems to be touted as fundamental to “religious freedom,” it is likely a similar bill will be introduced next year. 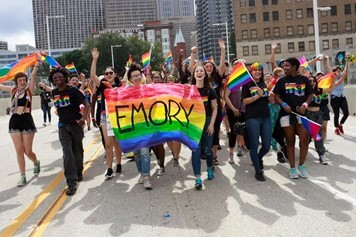 Emory GALA marches in Pride Parade in October 2017. This entry was posted in alumni updates, leadership, news. Bookmark the permalink.